Russia, Iran, Syria and Hamas have launched six steps to counter the US-Israeli plan to hit Iranian military targets in Syria, which National Security Adviser John Bolton finalized in Jerusalem two weeks ago. That plan is to strike Iran’s Al Qods Brigades and allied Shiite militia forces in Syrian and western Iraq, as DEBKAfile’s military and intelligence sources were first to reveal. The US and Israel agreed to provide each other with reciprocal air and military cover for their operations in Syria. This accord was first implemented on Aug. 23, when unidentified warplanes bombed a pro-Iranian Iraqi Shiite Khataib Hezballah convoy on the Syrian-Iraqi highway. Iranian Defense Minister Amir Hatami arrived in Damascus with a large military delegation to sign expanded military cooperation pacts with Syrian ruler Bashar Assad. Israeli and American officials who initially made light of this event were forced to take a second look. Iran was empowered by these accords to deepen its military grip on Syria, backed by the promise of Russian military and air cover modeled on the US-Israeli mutual commitment. Tehran and Damascus agreed to retaliate for every US or Israel attack on Iran’s Al-Qods or Shiite militia forces in Syria in the same coin, i.e. by targeting US military forces posted east of the Euphrates River along the Syrian-Iraqi border, or IDF forces inside the Golan enclave. Al Qods chief Gen. Qassem Soleimani was put in charge of these operations. Our exclusive sources also reveal that the new military pacts signed by Iran and Syria provide explicitly for three large Iranian bases to go up in Syria as hubs for the various Iranian command posts dispersed across the country; one outside Aleppo; a second between Damascus and the Israeli Golan border and a third at a still undetermined location. In the wake of these pacts, the United States, Russia, Iran and Israel are all engaged in military buildups in the Middle East and around Syria of intervention forces for a potential escalation. The Americans have prepared major naval and air strength in the region capable of rapid responses, mainly with Tomahawk cruise missiles. The Russians are massing a sea armada opposite the Syrian coast. Fresh arrivals on Friday, Aug. 31, raised the number of warships to 24. Syrian air defense networks are on the highest war alert since early this week. The IDF’s presence in northern Israel has been beefed up and the troops placed on high alert. On Friday, Iran said it had supplied allied Iraqi Shiite militias with ground-to-ground missiles with ranges of between 200km and 700km. 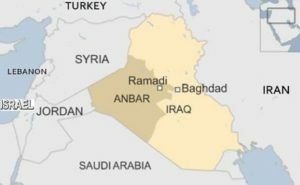 From Western Iraq, meaning Anbar, where Soleimani has concentrated a large force, these mssiles can reach Tel Aviv; and from southern Iraq, the Saudi capital of Riyadh. The senior US allies in the region are therefore under fresh Iranian missile threat from Iraq. DEBKAfile’s military sources note that these missiles have long been in the hands of the Iraqi Shiite militias under Tehran’s thumb, but Iran’s leaders decided it could do no harm to release the information to its enemies at this time. In former articles, our sources have pointed out that a US-Israeli showdown with Iran in Syria would inevitably spill over into Iraq. Hamas joined the emerging fray on Thursday, when its leader noted that the Palestinian organization also had rockets capable of reaching Tel Aviv. He was pointing up the collaboration between Gaza’s Palestinian rulers and Tehran.